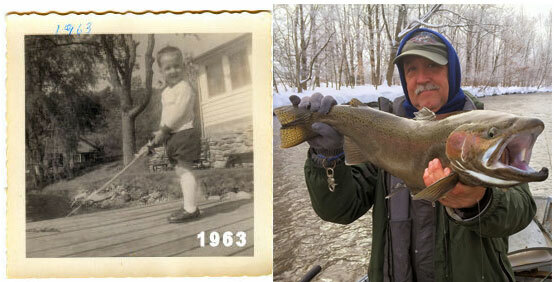 Your Guide - Angling Adventures Lake Charter & River Guide Service Pulaski, NY. Raised in the northwest hills of Connecticut, I began to feel the effects of my outdoors addiction at a very young age. As long as I can remember I’ve had a fishing rod in my hand and as soon as I was old enough to hunt I was out in the woods every chance I had. By the time I was 18 I had enjoyed more outdoor experiences than most sportsmen three times my age. It was in my early 20’s that I realized I got almost as much enjoyment introducing others to the outdoor sports that I loved and lived for. And by the early ’80s I was professionally guiding fly fishermen for trout and bass in Connecticut. In 1987, I wandered my way through upstate New York and discovered the incredible fishing opportunities that she harbored for trout and salmon, It didn’t take very long for me to decide where I would be guiding my clients from September through May. I have since spent all my time learning the waters, habits and techniques necessary to be successful in the pursuit of these awesome fish! I feel that as your guide it is my responsibility to teach you all the skills that “you” will need to be successful on your own and have the best time possible fishing on our streams and rivers long after your trip with me is over.